If you're a fan of the game PES Club Manager, you will certainly be more interesting if the names of the team played using their real name. 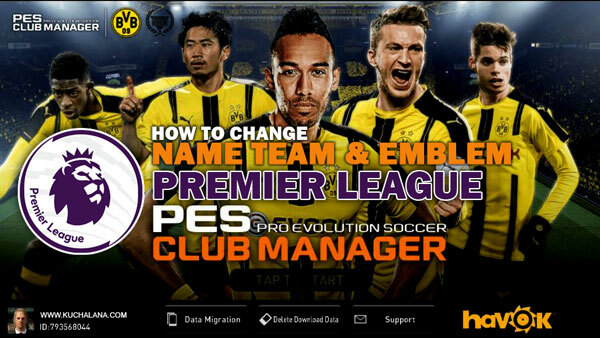 Actually you can change the name of the teams in PES Club Manager to the original name. Not only the name of the team, you can also change the team emblem (PES version) to the original badge. This will definitely make you more excited to continue to play PES Club Manager. For this entry, you will be given a complete list of the name, short name and logo (emblem) team for the teams that are in the Premier League. 2. Select the team to edit. 3. Here you can change 'Team Name', 'Team Shorthand', 'Commentary Team Name', 'Emblem' and jersey color and pattern (uniform). 4. After you finish, you press the 'Save & Return'. To change the Emblem, you must first download the logo size of 256 x 256 as above to your smartphone. Custom uniform but is provided with limited patterns and colors. 4 Komen untuk "PES Club Manager : Premier League Real Club Name And Club Emblem"
Thank you for the emblem you shared. And please share juventus emblem too. And can we change the fake jersey become real jersey for english and spanish league teams? Yes... we want the real jersey (kit) as well. I want MANCHESTER United real jersey.